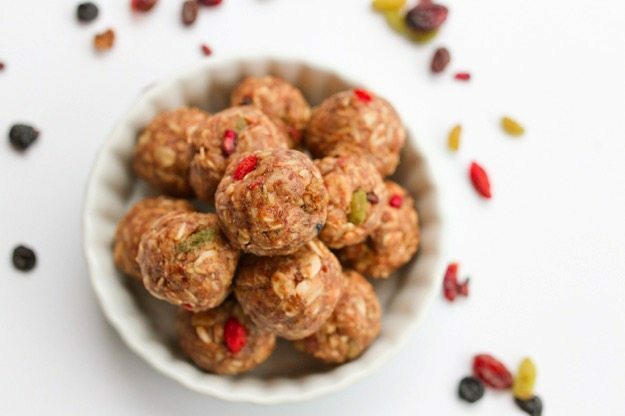 These superfood energy balls take a mere 7 ingredients and only 10 minutes to whip up. Make a batch today and you’ll have a portable healthy snack option for the week! 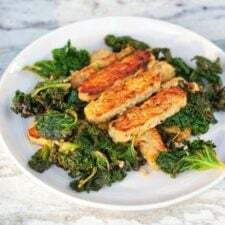 In an effort to prepare for today’s post we thought about what detoxing means to us and came up with a recipe to share. If I hadn’t been assigned the snack category I would have probably done a salad recipe. I love salads and in my head, detox = mountains of veggies = salad. Luckily I was forced out of my comfort zone because 1.) I already have a million salad recipes here (including a detox salad recipe) and 2.) the energy balls I’m sharing today are really good. Like, really really good. And they’re totally detox approved in my book. More info on these delicious balls soon, but first let me share the full detox menu. Don’t these recipes make you want to start a detox?!? 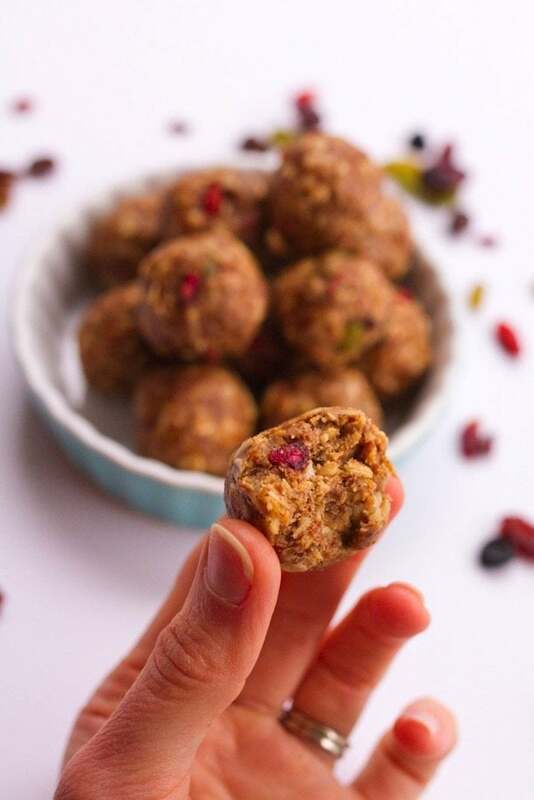 A little more about my balls, they’ve got a base of heart-healthy oats, almond butter and dates with a few superfood berries studded throughout. They’re healthy enough for a detox but sweet enough to satisfy a sweet tooth craving. This week I’ve been using them as a pre-workout snack before early morning workouts and as an after dinner dessert option. I used a mega antioxidant blend of berries that had golden raisins, cherries, blueberries, pomegranate, inca berries, goji berries and mulberries. Mulberries are my favorite dried berry flavor wise, but I love the pop of color that the other berries add. The best part about this recipe is that it’s highly adaptable. 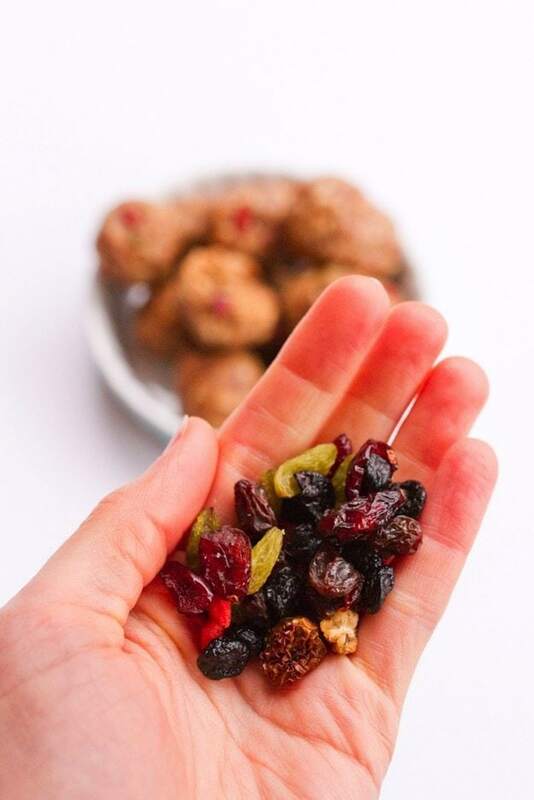 Feel free to experiment with your favorite dried fruit or use other add-ins like coconut flakes or chocolate chips. These balls take a mere 7 ingredients and only 10 minutes to whip up. Make a batch today and you’ll have a portable healthy snack option for the week! 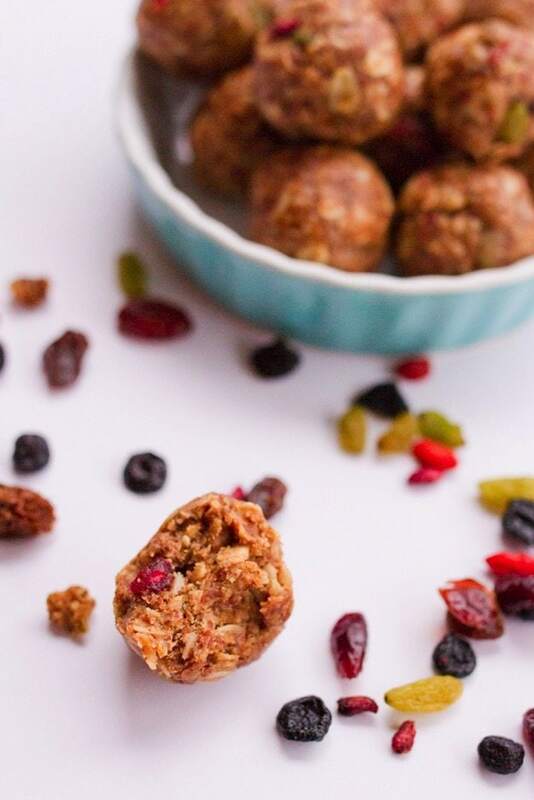 If you make these Superfood Energy Balls be sure to leave a comment and star rating below letting us know how it turned out. Your feedback is so helpful for the EBF team and our readers! Combine dates, almond butter and maple syrup in food processor and pulse until dates are fully chopped and everything is combined. In a bowl mix together oats, flax, dried fruit and cinnamon. Add date and almond butter mixture and stir until fully combined. Roll into 1 inch balls. Place balls into an airtight container and store in the fridge or freezer for snacking throughout the week. If you try this recipe for superfood energy balls please leave a comment and a star rating. Your feedback is so helpful for me and other EBF readers! Great recipes…the link for the veggie soup doesn’t seem to be working. Can’t wait to try it! Boo! Thanks for letting me know, Shaun. I’m working to fix it now. I LOVELOVELOVE energy balls like this! But I have actually never added oatmeal to them! I could LIVE off oats, so I need to try that! So fun to have you join us 🙂 Pinned! 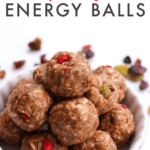 I love energy balls! Perfect snack and I love the flavors you have in here! They will be up next when I need some more bites! I reckon you’ve seen more than your fair share as well. 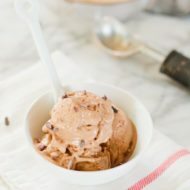 These look amazing, I want to try all these recipes! Hitting the reset button this week, woo! Soooooooooo glad to have you!!! And I must make a batch of these balls, asap! These look great! I’m a nursing mum & lately have been trying to find ways to get more oats & flax in to my diet to support lactation. I’m gonna whip these up with a tsp of brewers yeast & keep them on around for afternoon snacking. Thanks! I love detoxes that include real food. I don’t think I could do those juice cleanses. I just made these tonight – adding a little water to the Date/Almond Butter mixture, as my blender did not pulse them to perfection – but they are still delicious! Great grab and go snack this week. I love all of these wholefood ideas for detoxing in the new year – cleaning out your system is all about lots of healthy, whole food – in my opinion!! 🙂 No juices diets for me! 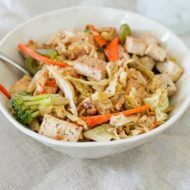 The paleo rice dish looks yummy – fried rice is one of my favourite meals, so this would be a perfect healthier version. Made these tonight for the week ahead. They taste really good! They were a little crumbly…any suggestions on getting them to hold together better – a little more almond butter? Other ideas? Yeah, a little more almond butter, maple syrup or an extra date! I think my weekend menu has just been planned! Hope you’re safely back home from Colorado! When I clicked on the superfood berry mix link under the ingredient list, it takes me to a different page saying not found. Can you please look into this or give me the brand name you used and where you purchased? I looked in Whole foods market but didn’t find any. I did try the recipe with other dry fruit I had on hand and it turned out wonderful! Thanks a lot for sharing:) I skipped the maple syrup as I am watching my sugar intake and also added a table spoon of chia seeds and 2tbsp shredded coconut for extra nutrition. I used Navitas Naturals Trail Mix — it’s in the supplement section at Whole Foods or you can order it online. 🙂 I’m glad your version turned out. Thanks so much for trying the recipe. Can you please fix the link for super food berry mix under the ingredients list. So sorry for the delay Swarna. It’s working now! No problem! You are a very busy person constantly working on posting a new blog post for the world 🙂 and I can totally understand the delay! The link is working now. Thanks for getting back to me on this. is there anything thing else I can use besides Maple Sryup? I haven’t tried it with other sweeteners but I bet other liquid sweeteners like honey or agave would work well. I love energy balls but never used so many oats. Love the flavours here, thanks! 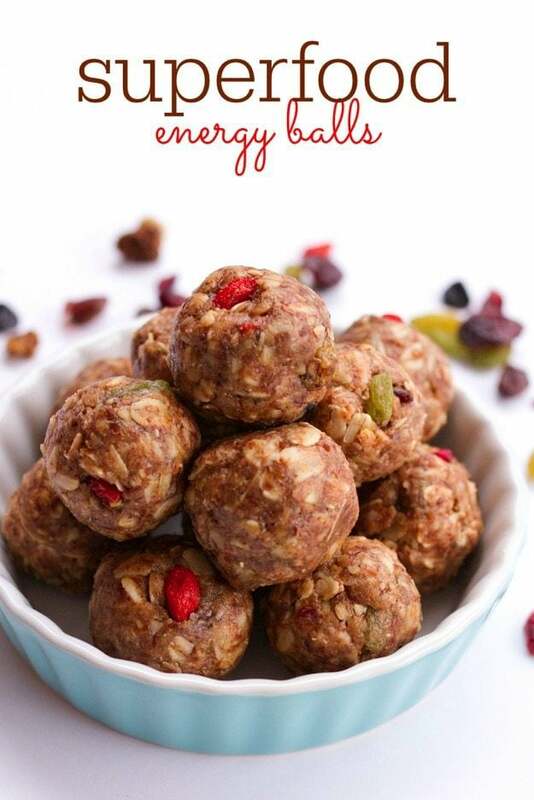 Your energy balls look delicious, great flavors. I have always soaked the oats first for this type of recipe. I’ll have to make this and try the texture without the soaking! Thanks for sharing your recipe. 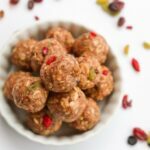 finally an energy ball recipe with a twist! I’m so excited to make this. P.S I’ve only just discovered your blog and i absolutely love it, the design the content, it’s definitely going to be one of my faves. Why on earth is there all the other rubbish beforehand. I wanted protein balls not a detox! It really put me off and I’d rather investigate if the recipe sounded good. (Which it does and I’ll be trying. Can’t beleive how much rubbish is on the page too. Hi, I need to know what weight the ingredients are. I am in UK and not sure if a cup is different size wise? The superfood berry mix doesn’t seem to be available any longer. What would you use instead? So glad you enjoyed these, Jane! Hi, does anyone know if I can substitute the ground flax seed with almond meal? Thanks!